Sliding doors Doimo Cityline, customizable centimeter both in height and in width, allow to separate the best anywhere in the house and lock closets to measure. The sliding doors can be adapted to all spaces to create new functional solutions and to solve aesthetic problems or thermal insulation between the various areas of the home. The system of sliding doors Doimo Cityline consists of three models: Basic, Magic and Goddess, which differ in the type of track and the profiles used. The interiors of the wardrobes are created by using the sliding doors can be equipped with a vertical rack system Ta-Tac or with the Free system, available with either ground-pillars is suspended. 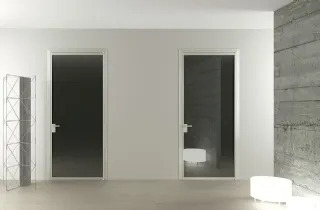 contemporary design, practicality, elegance and great personality: these are the main features that the sliding doors must possess to be of quality. Doimo Cityline offers innovative architectural systems, attention to every detail, which are translated into a valuable collection. contemporary style enhanced by a soul classic for swing doors Doimo Cityline, suitable for any environment and darredo style. The solidity and practicality are combined with the visual lightness of eleleganza dellalluminio glass. The materials guarantee adequate strength newspaper alluded.